Once you have downloaded the Fedora 24 ISO file, you will need to burn it to a DVD or create a live USB. Burning to a DVD is simple process in Windows and right clicking on the ISO file and choosing burn to disc will do the job for you. A live USB can be used to try out the Fedora OS without installing it, or can be used to install as a primary OS or in a dual boot with Windows. That depends on your choice and preference. 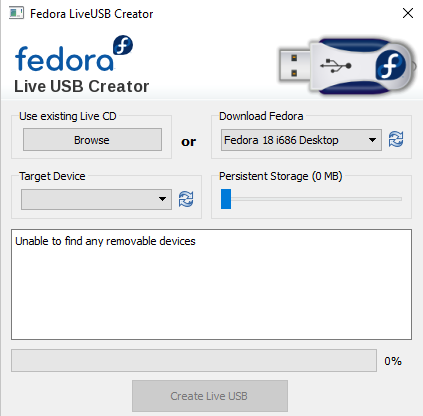 Here's how you can create a Fedora 24 live USB boot device. Once the download completes, trigger the installation set up and finish it. Launch the installation, and select the live CD image and the target device which will be the Pen Drive. You can also download the Fedora version if you do not have the ISO file already downloaded. Live USB creator works perfect in Windows 10 and is a complete non-destructive install i.e. you do not need to format or remove data from your Pen Drive and it won't harm the already present data there. It also supports the automatic downloading the various Fedora releases and the application will automatically detect all of the removable devices. Live USB creator allows the persistent storage creation, i.e. lets you allocate extra space on your USB stick where you can save files and changes in the OS which will persist in the next boot. The first way to create a Fedora 24 live USB is by using the Unetbootin software. 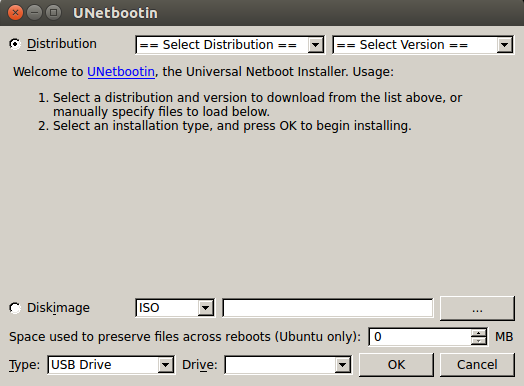 You can download the Unetbootin software from the Ubuntu Software Center. Unetbootin allows for the installation of various Linux/BSD distributions to a partition or USB drive, so it's a no different from a standard install, only it doesn't need a CD. It can create a dual-boot install or replace the existing OS entirely. Once you launch the software, you will get the below screen. Select the desired Distribution and the Version, navigate to the path where you have stored the ISO diskimage which you have downloaded. Select the type which should be "USB Drive" and drive of the removable media. Once done, click OK and a live Fedora 24 bootable USB drive will be created which you can use to try / install Fedora 24. Second method to create a live USB for Fedora 24 is through the command line. Plug in the USB disk and find out the disk its mounted on. Format the pen drive before you create the bootable disk and use the isohybrid command for an ISO to be recognized by the BIOS. Once done, you can sync and eject the device. Once you are done with creating live USB for Fedora 24, you can try installing Fedora 24 in Virtual Box. You can return to the complete installation for Fedora 24 for other details.